Personalized Picnic Kits for 2, Custom Printed in Bulk. Promotional, Deluxe. Navy Blue, Burgundy, Green. Budget Prices for USA, Canada. Bulk Picnic Kits for 2 in zippered carrying cases. We also supply wholesale blank (not imprinted) Picnic Kits for 2 at EQP (End Quantity Price). Budget Prices in USA and Canada for wholesale promotional Picnic Kits. American clients pay no taxes. PRODUCTION TIME: 3-10 days after art approval; blank items ship next day. 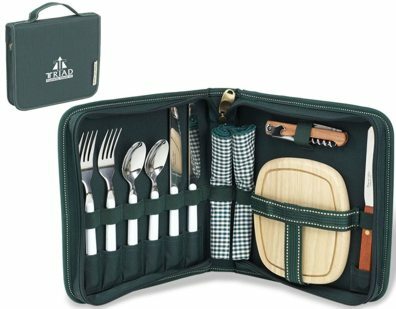 • Kit Includes: stainless steel flatware and napkins for two plus a hardwood cutting board, cheese knife and corkscrew. Ideal for travel or any impromptu occasion. Imprint Area: 2-1/2" x 6"
Packaging: Bulk; Individual Boxing: add $3.00 per picnic kit.